Copyright Kerim Aytac To See Here 2010 Straightline Press, courtesy of the artist. I have found Kerim Aytac’s recent photobook, To see Here, as ambiguous and minimal as his background story; “street photography that questions the value of the subject”. The book is an adaption of his project Nothing to See Here, which is about looking and what you might or might not subsequently “see”. This title alludes to the differences between looking and seeing, where as the seeing also implies comprehension, looking implies an input/output without interpretation or assessment. 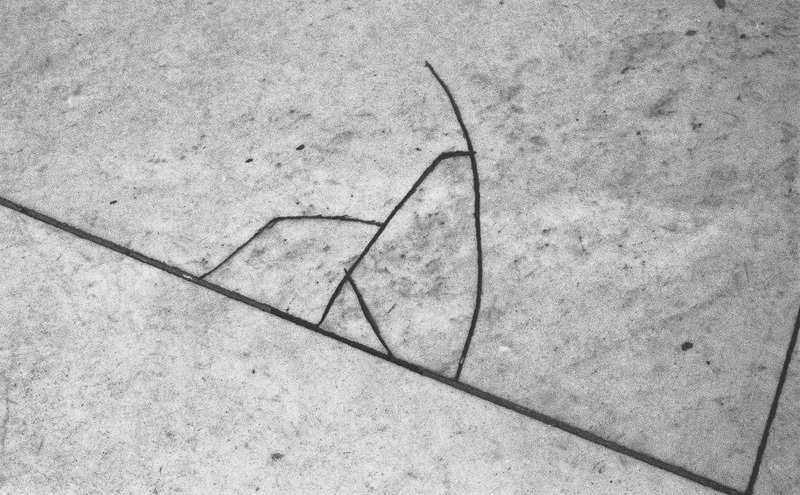 The ambiguity of most of Aytac’s black and white photographs is such that it is even difficult to read into them that these photographs are street photographs, perhaps with the exception of the characteristic hallway probably leading to an underground train. Even this photograph requires some knowledge of these passageways to decipher what the subject is, and how it might have been photographed. All but one photographs are an abstraction of the subject, framed such that each photograph has a minimum of contextual clues to identify the subject matter. The one exception, which also varies by presentation and layout, is a ghostly and imprecise representation of part of a person. 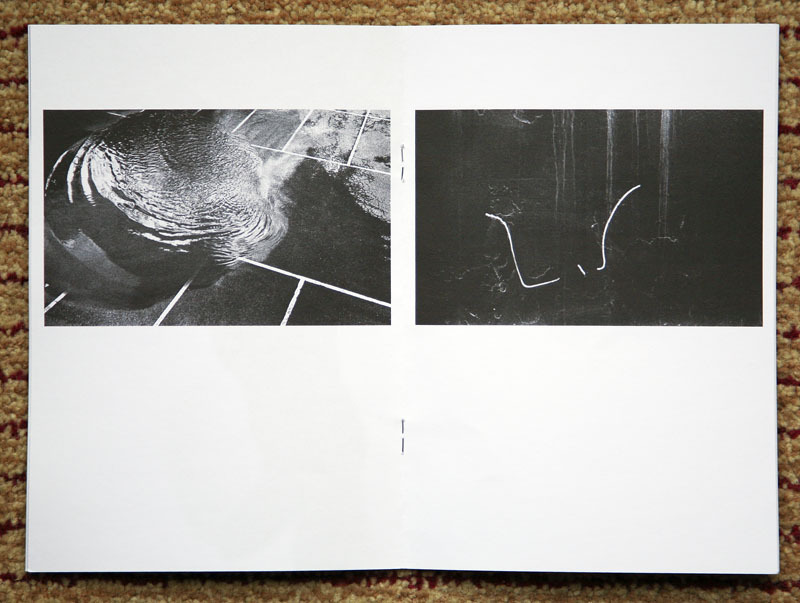 In more than one way, Aytac’s photobook reminds me of the work and photobooks of Ed Ruscha. I will come back to this image and thought in a moment. I note that the pair of patterned facing photograph has similarities shared with Pollack’s action painting, that the rigid appearing pictorial structure has features that I find in Hofman’s painting, the same for the abstract color (abet black, white and gray) similar in the geometric style of Diebenkorn and another with the cartoon-like hard-edges speak to Lichtenstein’s work. That all of the photographs are in Black and White relates to the abstract painting style of Kline, who was also a friend and influence to Aaron Siskind, another street photographer who abstracted the reality in black and white around him. 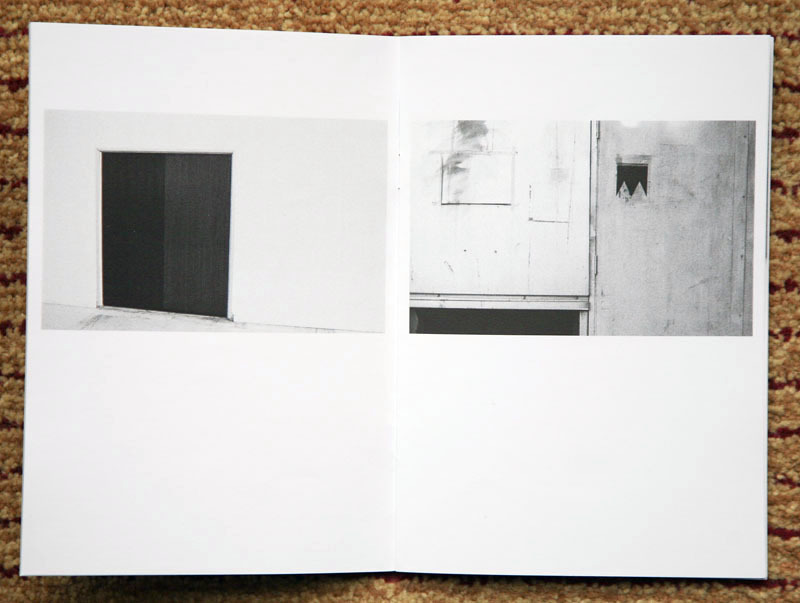 The design and layout of all of the photographs within this book are consistently the same, save one, the photograph of the truncated individual. All of the photographs are placed in the upper section of the page, one photograph per page, with amply white margins. 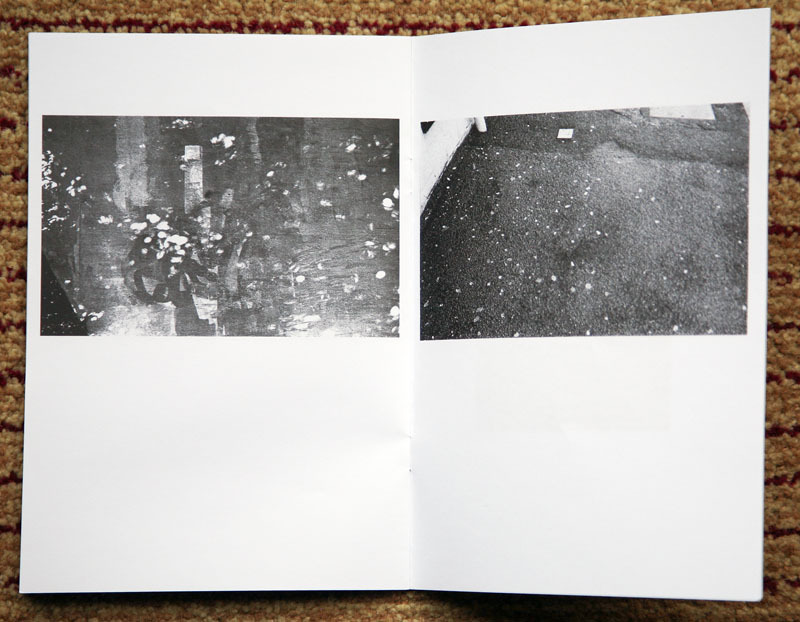 The lone photograph of an individual is a two page spread, with full-page bleeds. Which reminds me of Ed Ruscha’s photobooks, that Ruscha would introduce into his photobooks, e.g. “Various Small Fires”, a photograph that would be not consistent or related with the remaining body of work, as Ruscha states “seemed to make the book more interesting and gave it some cohesion.” Interesting, yes, cohesion, not necessarily, but that is the type of non-rational contradictions that Ruscha enjoys introducing, which is a similar element that Aytac is introducing with this photograph. An alternate read is that the photograph of this individual represents the photographer or maybe the reader who is indistinct, not sharply delineated and slightly out of focus. That this person is also not fully focused on what is before them, looking but perhaps not seeing. This person is just passing mindlessly through life, a passing figment, perhaps missing opportunities if they might just pause a little longer in their rush to live life. The last thought on this photobook is that the quality of printing suffers from the combination of the matte paper and printing process, the results are rather mushy with the shadows blocked up. This book printing further lends to the abstract quality of the photographs, maybe by design, but when the corresponding photographs are viewed on Aytac’s website, they have a longer tonality and better delineation of the subject’s content and details. 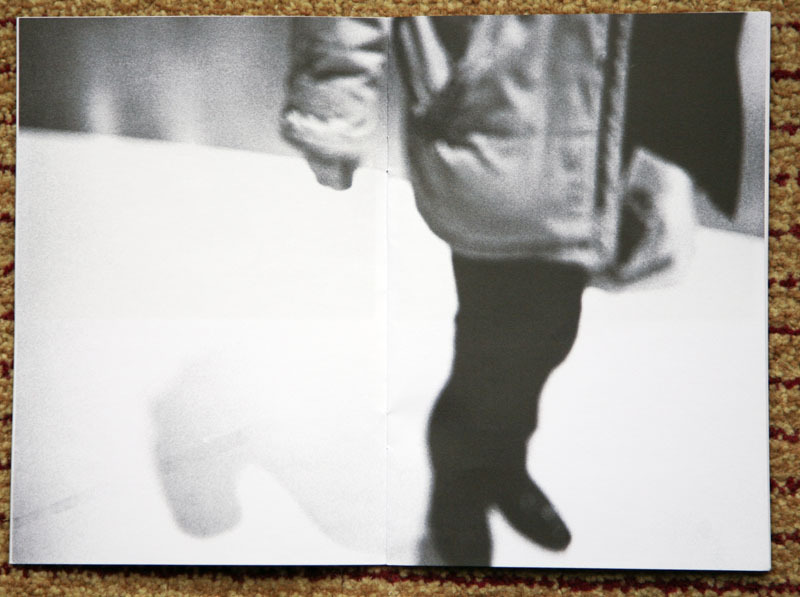 This photobook has tiff covers, without text or pageation, in an edition of 300 copies.